Britt Kelly Slabinski (born December 1, 1969) is a former United States Navy SEAL who was awarded the Medal of Honor on May 24, 2018 for his actions during the Battle of Takur Ghar. Slabinski is from Northampton, Massachusetts. He earned the rank of Eagle Scout at age 14 on March 9, 1984. Upon graduation from Smith Vocational and Agriculture high school in 1988, Slabinski enlisted in the U.S. Navy. He attended boot camp in Orlando, Florida. Upon completion, he received orders to attend Radioman Class "A" School in San Diego, California. There, he trained on the basics of naval communications graduating in spring 1989. He qualified and was accepted into Basic Underwater Demolition/SEAL training (BUD/S) at Naval Amphibious Base Coronado. He graduated in January 1990 with BUD/S Class 164. Slabinski's operational assignments include SEAL Team FOUR, 1990 to 1993; Naval Special Warfare Development Group (NSWDG), 1993 to 2006; and Command Master Chief of Naval Special Warfare Tactical Development and Evaluation Squadron TWO, 2006 to 2008. He was the Senior Enlisted Advisor of the Joint Special Operations Command, Washington, DC Office, 2008 to 2010 and Command Master Chief, Naval Special Warfare Group TWO, 2010 to 2012. Slabinski has completed nine overseas deployments and 15 combat deployments in support of the Global War on Terrorism, including Operations Enduring Freedom and Iraqi Freedom. He retired in June 2014 as the Director of Naval Special Warfare Safety Assurance and Analysis Program after more than 25 years of service. 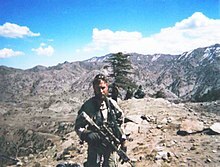 The March 2002 ambush that resulted in Slabinski's heroic actions (now known as the Battle of Roberts Ridge) was described as one of the most savage and controversial battles of the Afghan war. 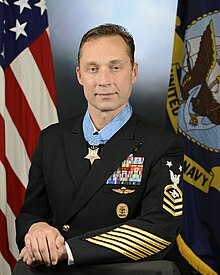 The Medal of Honor awarded Slabinski is an upgrade from the Navy Cross award he previously received. In 2018, for his heroism during the same battle, TSgt John Chapman was posthumously awarded the Medal of Honor (he was "the one teammate [who] started moving uphill toward an enemy strongpoint"). Slabinski has an Emergency Medical Technician/Paramedic National Certification. He is self-employed as a corporate consultant. He has one son who is also an Eagle Scout. Slabinski appeared in the Spring 2019 issue of the American Battlefield Trust's magazine Hallowed Ground, writing about his visit to the Fredericksburg and Spotsylvania National Military Park. Wikimedia Commons has media related to Britt K. Slabinski. ^ "COMMAND MASTER CHIEF SELECTION BOARD RESULTS". United States Navy. Retrieved 9 May 2018. ^ a b c d e "Retired Master Chief Britt Slabinski to Receive Medal of Honor at White House Ceremony | Navy Live". navylive.dodlive.mil. Retrieved 9 May 2018. ^ Clark, James (7 May 2018). "SEAL Team Six Vet Britt Slabinski To Receive Medal Of Honor For Operation Anaconda". ^ a b Naval Special Warfare Command (2018-05-07). "Retired Master Chief Britt Slabinski to Receive Medal of Honor". navy.mil. Retrieved 2018-05-09. ^ Martin, David. ""Not a day goes by that I don't think of it": Medal of Honor recipient on Afghan battle". Retrieved 25 May 2018. ^ "BRITT KELLY SLABINSKI | Medal of Honor". themedalofhonor.com. Retrieved 25 May 2018. ^ "Navy SEAL Receives Medal of Honor for Afghanistan Actions in 2002". This page was last edited on 30 March 2019, at 22:21 (UTC).